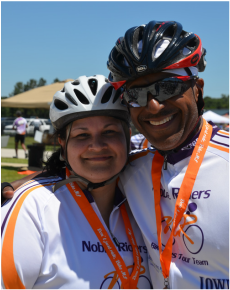 Emily's Story - Noble Riders, Inc. I was born and raised in the The Bronx, New York. Since 2007, I've lived in a peaceful slice of country living known as Spring Hill, FL. I've gone from crowded, noisy streets to open space and fresh air. Although I've also given up snow storms for hurricanes, I get to enjoy the sunshine and warm weather year round, and not just 3 months out of the year. I'm still a Yankee, Giants & Jets fan (sorry, but not a Mets fan - that'll be Manny) at heart, but I cheer just as loudly for my adopted teams, the Tampa Bay Rays and Buccaneers. My first thought was, "Wow, I'm now one of Jerry's Kids." (a very common misconception); my second thought was, "How will this affect my marriage?" (it's been a wonderful 23 years!). Up to that point, I was the picture of health - never even had a hospital stay. Now, I was faced with a chronic, and possibly debilitating illness. What would I do? Could I still work? Would I loose the ability to walk and/or see? I was scared! One of the first steps I took was educating myself - knowledge is power! That's when I found out about the National Multiple Sclerosis Society. I read about the fundraising walks and bike rides held every year, and decided I wanted to participate. I signed up for my first walk that took place in the Fall of 2003. The support I received from my family and friends was overwhelming! I couldn't wait to walk 7 miles through the streets of New York City - the first time I would ever walk so far. About three months before the walk, I experienced my first relapse - I lost feeling in both legs, feet and hands, and had a severe case of the "pins and needles". I underwent a rigorous course of steroid treatments that took away my sense of taste. But no matter what, I was determined to do the walk. Maybe it was for the best that I couldn't feel my legs and feet - I finished the walk, with my husband, Manny, by my side, and not once did I complain that my feet hurt...LOL!! The following year, I did the NYC MS Bike Ride. Now that was an event I was unprepared for. I didn't train the way I should have, I had the wrong type of bike, and I was dressed in jeans and sneakers. I only completed 27 of 30 miles, and got SAGged in, but Manny was by my side the whole time encouraging me along the way. I knew it was time to give up when an older woman, riding an adult tricycle, passed me. Although I stopped riding after the event, Manny continued to ride, and now does the MS Bike Ride:The Citrus Tour. I recently started to ride again and have a great group of riders that support and encourage me. 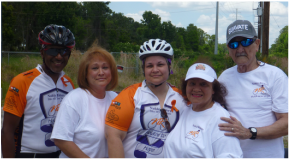 My goal was to one day participate in Bike MS: The Citrus Tour with Manny by my side. My parents and sister greeted me and Manny at the finish line! Lots of tears were shed as I successfully completed Day 1 of Bike MS 2014! In 2014, I was finally ready to participate in my first Bike MS event! While I was only able to do one day, I did ride 53 miles with my fabulous friends Katie G. and Katie L. who rode with me and stood by my side as the paramedics helped cool me down after I overheated and had a dizzy spell. Manny, along with members of Noble Riders, waited for me just before the finish line so that we could all ride in together! What made the day even more special was my family waiting for me at the finish line!. It's been 16 years since my diagnosis. In 2002, there were only 4 disease modifying medications available - all injections (ouch!). There are now thirteen FDA approved treatments with three being oral. I started with Avonex, and have been on Rebif, Betaseron and Copaxone - each one a painful injection with site reactions, fever and chills and lots and lots of fatigue and brain fog. I am now on the oral medication Tecfidera - no more painful injections, no more flu-like symptoms and best of all, no more fatigue or brain fog! The world looks a whole lot different with 20/20 vision! I've had lots of ups and downs, and several relapses along the way, but I'm in a better place than a lot of others are in. I look forward to cheering on Noble Riders as they participate in the MS Bike Ride every year, knowing that each and every rider has my back! Life hasn't been easy, but I'm stronger than I thought I could be.